Marketers are well familiar with the concept of segmenting their marketplace. Segmentation is the process of dividing a broad and undifferentiated set of consumers into ever-smaller segments until you have identified that group of potential customers that is the best match possible for your product or service. My wife is also afflicted with this contagion we call marketing and that gives rise to some strange conversations in our household. One such conversation a few years back resulted in our developing an easy-to-understand explanation of market segmentation we refer to as finding your gay Acadian dog lover. The key to segmenting the marketplace is to identify those traits — some demographic, some taste-based, many certainly geographic — that define the customers most likely to be interested in your product or service. Not only does the process tell you a lot about who you’re trying to sell to, it also gives you a lot of insight into how you might reach them. Market segmentation belongs in the strategic up-front part of a marketing plan because it defines the pain common to the customers in your target market segment or niche, and helps you figure out positioning and messaging that will be effective. As our resident neuromarketer Bob Bailly writes in his contributions to this blog, the most effective appeal is an emotion-based appeal, and segmentation helps you identify the emotions and passions of the people you’re targeting. When I get to the implementation part of the marketing plan, the part where I need to decide the proper mix of tools, tactics and channels to actually transmit our messaging to our target customers, I like to use a different sort of segmentation that I call the three buckets of customer segmentation. It looks not at how the market might be divided according to a propensity to be interested in your product or service. Rather, it looks at the customers you’ve already identified as your target market and then segments them based on their individual propensity to actually buy your product or service some time in the near future. This whole process is based on an understanding that you can’t sell anything to anyone who doesn’t feel the need for it. The more burning that need, the more motivated your customer will be to buy. While “need” can be manufactured by willy marketers — does anyone really need a 10th or 20th pair of Jimmy Choo shoes? — our approach in B2B marketing is based more on the pain that a customer is feeling because something within her or his company is failing in some way. Please don’t think that this means we abandon emotion here; the most effective B2B marketing connects the dots between a pedestrian enterprise requirement and the emotions — fear of failure, job loss, prestige or joy of achievement, success and reward — associated with leaving that requirement unmet or with solving it. In bucket number one, then, our customers knows their pain and are actively searching for a solution. To win those customers’ business, you must get your message into the channels where they are looking for a solution. In today’s world, that almost always means search; customers are turning to the net to find solutions for their problems and if you are going to win the business, you must be found here. It is critical to remember that customers rarely search for specific solutions, so using keywords that characterise your product or service may not get you found. This is especially true if you, like most technology companies, have developed a novel way of solving a problem; by definition, the marketplace knows nothing yet of your solution and so can’t go look for it. You need to figure out how your customers are going to characterise the pain they’re feeling, or the objective they’re seeking to accomplish, and write your Google ads or optimise your website content accordingly. Besides search, customers actively seeking a solution look elsewhere. They might go to a trade show looking for exhibitors with products or services that meet their needs. They are unlikely to start looking for advertising. They might look for media articles about their issue. And, if they have selected a short list of vendors, they might access white papers or other material you make available about your product or service, and they might read analyst reports. Customers in Bucket One are the most attainable customers imaginable. They have a need that you can meet and they’re looking to spend money. These customers, depending on your sales cycle, are your revenue for this quarter and the next quarter. But you’re going to have to compete for them against anyone else they might find in their search. Customers in this bucket share one critical trait with Bucket One customers — they know they have a pain. However, for any number of reasons, they are not actively searching for a solution to that pain. They may have become inured to it. They may believe there is no solution to it, or that available solutions are too costly or too cumbersome. Or, they may have been burned in the past by solutions that did not live up to their billing. These are the customers I like the best. The marketing job here is not one of hard selling, it’s one of educating, and so it’s a process in which a great deal of value can be created by the vendor for the purchaser. For example, I often engage with prospects for our PR services who are looking for a proposal from my firm and from a couple of others. In talking with that prospect, I sometimes discover that their real challenge is not picking the right agency, it will be winning budget approval for the program. So I move into a different mode. I tell them I can develop a proposal and take my chances beating out the other agencies but that I still might not win the business because the real hurdle will be winning executive approval. I suggest they leave aside the competitive process and if they do, I offer to put in as much effort as necessary — do deep research, meet with the executive team, put in a lot of time, design the actual program — to create a proposal designed not just to be the best they could receive but also designed to solve their real pain, winning budget approval. Such prospects are in Bucket 2 because although they know what their real pain is going to be, they aren’t pursuing a solution designed to solve that pain for them. I show them a way to solve their real pain and, not coincidentally, disintermediate my competition in the process. This is the possibility with Bucket 2 prospects. If you can be the vendor who educates such prospects about the availability and value of a solution that genuinely solves their real pain, you may well have the field all to yourself. Even if you can’t kick the competition right off the bus, you still stand a better chance of winning the business if your educational process is of better quality, less directly promotional and more authentic than the competition’s. Media relations, white papers, webinars and other content-marketing tactics are the most effective way of reaching and winning Bucket 2 prospects because these tactics, done properly, are all about educating the marketplace. Messaging needs to acknowledge the pain, correctly identify the costs associated with it, and make the business case for your solution in an emotionally appealing fashion. It can be a longer process than simply winning the business of a Bucket 1 prospect who’s ready to buy. 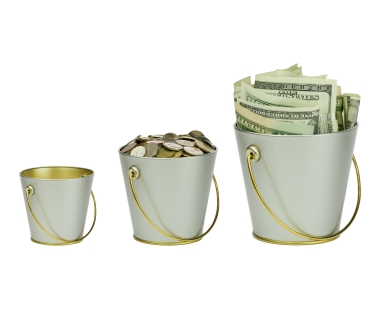 You should think of Bucket 2 as being your pipeline for the next three quarters beyond this current quarter. In my world of technology marketing, the biggest challenge is often making customers realise that the old way of doing things is costing them in serious ways or, at least, that a new way of doing it will create new value. These customers usually are not even aware of the downside of what they’re doing or the upside of adopting new ways of doing it. They are in my third bucket and, like Bucket 2 prospects, they respond best to marketing approaches that open their eyes without yet trying to open their wallets. Many of the same educational materials that work well with Bucket 2 work well here. The messaging, though, needs to create an awareness that a problem actually exists before trying to make the case for a solution, let alone trying to sell in your solution. Early in my career, I developed a communications strategy for the federal government around soil conservation. Our target was urban and off-farm Canadians who needed to understand that soil erosion was a serious economic issue that could have an impact on the quality and cost of food. Why did they need to understand this? Because the feds were spending hundreds of millions of dollars on soil conservation and remediation programs and wanted to cultivate broad taxpayer support for such spending. Not such a big deal, you might think. You’d be wrong. The change, though subtle, fundamentally altered the entire impact of the poster. It changed from an urgent alarm telling urban Canadians that there was a problem they needed to pay attention to, to a gentle reassurance that everything was being taken care of. How could our target audience develop support for the soil conservation program and its massive spending if they weren’t told in the first place that there was a serious problem that could affect them? What bucket are your prospects in? I’ll assume you’ve done a good job of market segmentation and that you know who your gay Acadian dog-lover, or your exact market niche, is. But do you know which of my three buckets each of those prospects are in? And if you do, have you figured out the different approach you need to take depending on which bucket they’re in? I’d love to hear from people who have designed their marketing programs with this understanding well in mind.